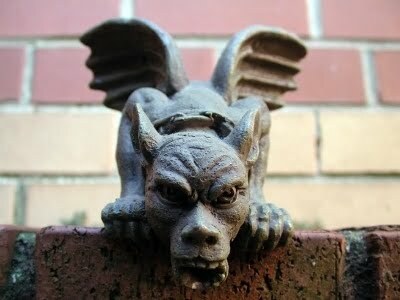 Don’t Forget to Feed the Gargoyles! I’m checking the battlements today. Reinforcing the perimeter. Making a list of all the fences that need mending, the lookout towers that need tending and checking the map for the latest set of landmines. For those of you who’ve been following this blog, it’s been fairly apparent that this daily creative writer has had a rough 2013 – so far anyway. I’d say invasions, ambushes, Trojan horses and, at least, one bomb scare have dominated the last six months. I’ve surveyed the scourged battlegrounds and tallied up the losses, and though I want to signal the trumpeter that it’s time to blow the all clear, I’m still a bit suspicious that there’s one last infantry headed this way. Self-protection is second nature. The first time we are confronted by a schoolyard bully, a flat tire on a desolate interstate, or one of those long, lonely dark-night-of-the-soul type events, we suddenly realize that we’re on our own out here in the crazy, scary topsy-turvy world. If we’re lucky, our parents, sibling, family and friends help set up a Kingsguard of sorts, offering, at least, a modicum of protection. But in the end, there comes a time when we are left alone to fight the good fight. And it’s about that time that the walls start to go up. Boundaries, fences, lines-in-the-sand…we all have them, and they’re not necessarily a bad thing. While we tend to think that creativity must be allowed to run free, I’ve said many times in this blog that sometimes the best way to coax the muse out to play is to create a safe, sequestered haven for romping. Though all of us have our sensitivities, our sore spots and our “don’t even go there” prohibitions, it’s the creative soul that sometimes suffers the most. That’s because we can imagine every scenario – the good, the bad and the catastrophic. In some ways, we are optimists because we know things can always get worse. Unfortunately, we can conjure up any number of outcomes, down to the tiniest details. And human nature being what it is, I bet you can guess how often the worst-case option is the one that gets dwelled on the most. It’s certainly important to let our guard down – for writers and other creatives, the world may be too much with us, but we also need to be with the world, for motivation, for stories, for the images and imaginings that fuel our work and inspire our vision. But we must remember to protect ourselves as well, to keep at least one eye on the horizon, vigilant in the face of whatever invaders may be waiting to land on our doorstep. I know I’ve let the watchtower go black these last few months. The sentinels have gotten lazy in their drills. The drawbridge has probably been left unattended one too many times, and all sorts of vagrants, ruffians and ne’er–do–wells have snuck in unnoticed, or sit anxiously awaiting their chance. I know that in order to continue on my creative path, to fulfill my commitment to daily writing and all that entails, I’m going to have to shore up those defense lines, dig some trenches, and probably call out for reinforcements. They say good fences make good neighbors. I’d say good defenses make happy creatives.